Back in August, I was given four passes to head to iT’Z Willowbrook for a day of family, food and fun. They also have a location in Pasadena. iT’Z has a pizza buffet, arcade game room, and they offer attractions such as bowling and an indoor roller coaster. They do offer specials. 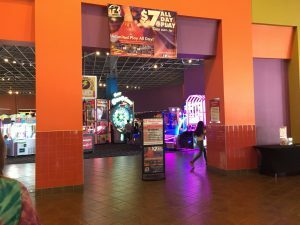 They have a “Really Big Deal” which is where each person gets a buffet, unlimited games (NOT the games you play for tickets) and unlimited attractions. Those were the passes we were given. We had been there about five years ago, and my daughter was 8 at the time. She was excited to go back, and she asked me if she could bring a friend. We live over 2 hours away, but it was worth the drive. We got up one morning, packed the car and got ready for our trek into the city. 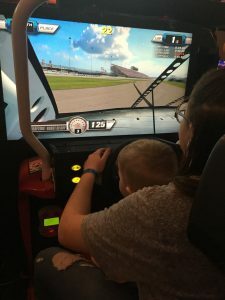 I took two teenagers and two toddlers. Thank goodness for my double stroller. That’s the only thing that keeps me sane when going into a busy, public place with two toddlers! When we got there, there were several people there, but the line to get in was moving quickly. I did have to talk to the manager since I was retrieving my passes, but the staff was extremely professional and courteous. While we were standing in line, my grandson threw down his sippy cup, and he spilled milk everywhere. The staff didn’t even grumble when I let them know what happened. Of course, I apologized. The food selection was nice. They have a salad bar, various pizzas, hot dogs, nachos, baked potatoes, mac and cheese, and several other random foods to choose from. There also was a dessert bar, and you could purchase cotton candy. The kids were happy with the food selection. They really wanted to go play. They did have fun playing the arcade games. The manager pointed out that we had unlimited game play for games that DID NOT offer ticket prizes. However, it still seemed like all of the games were taking money off the card to play. That was a little confusing for us, but it was ok. The kids still played plenty of games. They did enjoy the games where they could win tickets. The tickets the teenagers won went to the toddlers. My daughter took her brother into the redemption section to pick out the prizes he wanted. The indoor roller coaster was a hit. They also have a rock-wall and this other kid-friendly ride that just goes straight up about 20 feet and back down. 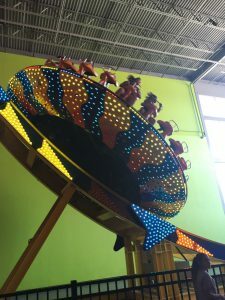 Only one of my boys was tall enough to ride it, and while the teenagers thought it was cheesy, he enjoyed it. They enjoyed the roller coaster and rode it about 5 times. We also had a free game of bowling, but we were tired. We would have had to wait for a lane, and so we passed on bowling. Before we left, we sat down and had another drink and a snack. That way our tummies were full when we hit the road back home. All four of my passengers were asleep before we even left Harris County on the way home. We had a great time. If you’re in the area of Willowbrook or Pasadena, and you’re looking for family friendly fun for the day, stop in to iT’Z. You’ll enjoy it!